Gurgaon Academy is a premier tutoring service provider company in NCR Region of Gurgaon.It has been helping students achieve their potential.Gurgaon’s leading private tuition /Coaching Institute with a personal touch; Gurgaon Academy brings learning to you, which is tailored to your needs and busy schedule. We are No.1 Private tutoring service provider in Gurgaon. We provide academic help, tutoring help, best tutoring, result oriented class room programs for the students and people living in the areas of Gurgaon,Gurgaon City,DLF City,Sushant Lok,South City,Laburnum,Udyog Vihar,Malibu Town and all places, all sectors in Gurgaon. Our highly selected, experienced and qualified Teachers provide the best tutoring solutions of any academic need. You can begin the registration process online or telephone 99996 50006, 99996 40006 for a no obligation consultation to explore how group or personal tutoring at Gurgaon Academy can make a difference for you, your family or organisation.Gurgaon Academy provides best coaching and tutoring help to students or group of students. We provide dynamic, result oriented Tutoring/Coaching for students of all the reputed schools like American Embassy School, British School,G D Goenka World School, Pathways International, Scottish High, Banyan Tree,Shri Ram School Aravali,Modern School,DPS Schools, Lancers International School, Ryan International,Vasant Valley,DAV Schools and all other schools located in the NCR regions of Gurgaon,New Delhi.We are also available for libraries, companies,individuals, schools or other organizations. Gurgaon Academy provides coaching for all classes from 1st to 12th and for higher level, college level and for many examinations like SAT, GMAT, GRE, TOEFL, IELTS, MCAT, CAT, pre-medical and Pre-engineering admission entrance tests.We provide best and result oriented private coaching,home tutoring services, in all subjects:- Maths,Physics,Chemistry,Biology,English,Hindi,German,French,Computer/IT,Conversation class for Hindi/English,English Conversation,Hindi Conversation and Spoken Classes. Gurgaon Academy’s mission is to help people regardless of ability, age or background to realise their goals for the future through the support of the highest quality tutoring and coaching services in Gurgaon.We aim to help all students achieve their potential by giving them encouragement, understanding and individualized attention. We aim to solve unsolved problems distinctly in an innovative manner. We strive to raise our students’ aspiration and achievement levels by infusing them with enthusiasm for the subject, self-confidence, motivation and direction. Our mission is to promote the fundamentals of any subject, with an emphasis on participation, education, involvement, and fun. 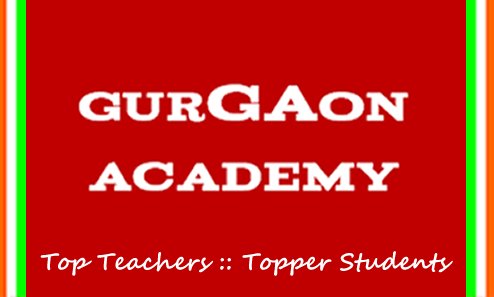 The Gurgaon Academy, based in Gurgaon seeks to enhance the academic skills and personal development of all Students,Learners,Beginners,Children,Adults and all age group people through Tutoring and Coaching programs designed to develop excellence in academic area to produce best results. A commitment to excellent services, innovation, diversity, creativity, honesty, integrity, dreams and imagination. Quality and Difference: It is unique among private tuition agencies in that we work for the client which enables us to monitor the tuition quality to help ensure results are achieved. Results: We secure the best possible results with maximum number of best grades and distinctions. Selectivity: Ours is a reputed tutoring body and selective tutoring company with regards to the tutors who work through us. We look for committed and professional tutors who share our ethos. Reputation: We are recognized nationally and locally as a leader in educational service for the people across NCR region of Gurgaon, Delhi, Noida and all. We are No.1 Private Coaching Service Provider in Gurgaon. Experience and Specialization: Our Teachers specialize at the level you require from school entry and Common Entrance through to CBSE, ICSE, IGCSE, IB Syallabus, Colleges, University and beyond. Tailored Service: Our consultants (over the telephone) will use the background information you give us to complete a full requirement profile to match you with the right. Confidentiality of Data: Our Teachers do not share the name,ID,address,phone numbers or any personal details of any student or client to any body else. It is done for security reasons.